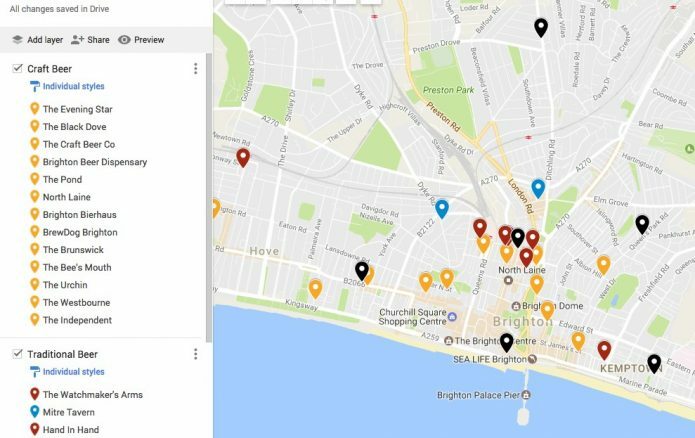 If you want to buy good beer in Brighton, there’s no shortage of places. In fact, there’s so many pubs to choose from, I thought it a good idea to get a nice little map organised. You should be able to add this to your account and use it to guide you around the city on your phone. I’ve emphasised smaller, independent shops and pubs, but included one or two craft beer non-independents (Brewdog, Craft) due to their quality and selection. Some have been missed off, sorry about that. If you’ve a suggestion, please email or contact on the site and I’ll endeavour to update it. Bear in mind this is not meant to be a complete list of pubs in Brighton, just a list of what I consider to be the best places available based on selection, quality, service. I’ve put those with craft beer available in the craft section (e.g. The Evening Star, Craft), even though they may have quality cask available, they have a selection of craft. In fact as far as I know, the only craft places that don’t have cask on are Brewdog, The Pond and The Black Dove. All the other places serving craft kegs have cask on as well. Sorry for excluding any other lovely places from this list!